With The Dark Half I begin to delve into the work of Stephen King. This novel attempts to answer the question "where do you get your ideas from? ", only King answers the question in a rather twisted way. Thad Beaumont is your mild mannered author and college professor. He has written one literary novel to great critical acclaim but poor sales and another literary novel to nothing more than poor sales. As George Stark, however, he has written three crime thrillers to great commercial success. The money, as they say, poured in. Up until the opening of The Dark Half, Thad had kept secret that he was the man behind George Stark, building a wall between that fictional author and his own life and work. Rather than allow another man to expose Thad as Stark, Thad allows People Magazine to do a feature on Thad as George Stark and the death, if you will, of George Stark. Outside of an opening interlude into Thad's childhood, which is very relevant, the true beginning of The Dark Half is Thad and the fictional death of fictional George Stark in People Magazine. Then people start dying. Brutally. Creatively. The suspect: Thad Beaumont. His fingerprints are on the scene and except for the first murder, there is motive. The killings are connected to the outing and subsequent elimination of George Stark. The police initially think that Thad is responsible, but Thad wonders if it isn't George Stark, Thad's literary alter ego come to life. Despite having to answer how a pen name for an author can come to life and kill, The Dark Half is a reasonably straightforward Stephen King novel. The focus for the first half or so of the book is mostly on Thad and his family and the police interactions with them, with the murders happening off the page. We see some set ups for the killings, but the deeds are done out of sight. As the novel progresses George Stark takes a stronger role in the story. The Dark Half contains several grotesque descriptions and things have the potential to get incredibly nasty in a hurry, but in terms of overall gore and disgust, The Dark Half is a fairly tame novel. It is written in a matter of fact manner which gives the feeling of King telling the reader the story rather than crafting it with sentences and ink on paper. It has that easy reading feel and moves along at a reasonably brisk clip. 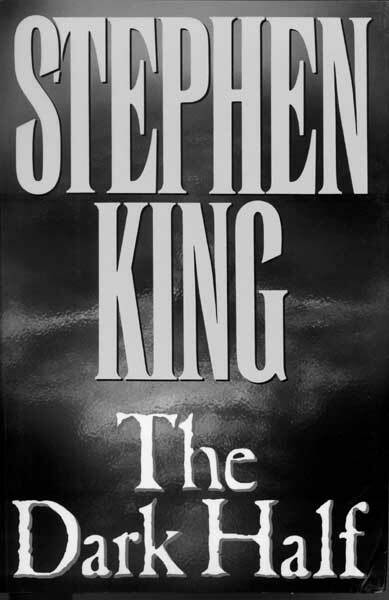 The Dark Half is unlikely to hold up as one of Stephen King's strongest or "best" novels, but it was an entertaining read, reasonably well crafted with some dramatic tension. What could have been a real...oh, I'll just say it...nail biter, is tamer than I had anticipated. The Dark Half may not be the best starting point for new readers of Stephen King, but one also does not have to be a King aficionado to enjoy it. Stephen King is a talented storyteller and even in what must be one of his lesser efforts, King is still capable of taking the reader along for a ride. Some rides are just more exciting than others. The Dark Half is a solid piece of work, but not an exceptional piece of fiction.